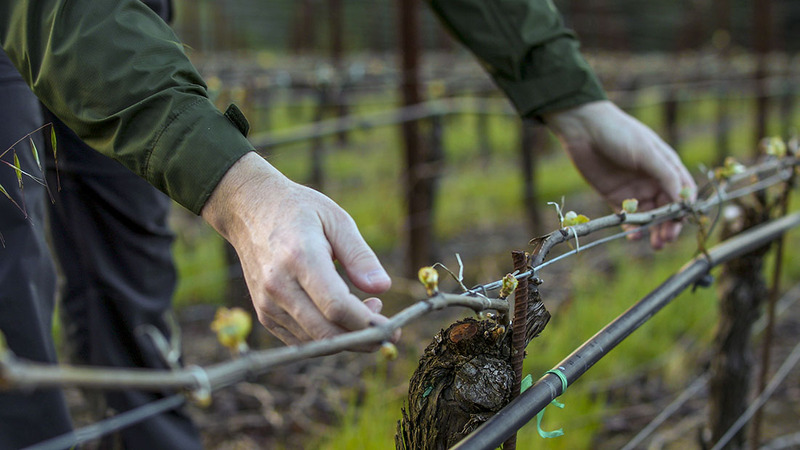 Following the moderate 2003 and 2004 yields at Hyde vineyard, ourblock of mature Old Wente chardonnay naturally produced a sizeable crop that necessitated successive cluster thinning passes to ensure appropriate concentration of extract and richness. Cluster size was elevated due to late spring and early summer rainfall, yet berry size was more normal with a good amount of classic tiny Wente shot seedless berries that annually hold the secret to the wine's mineral energy. Harvest took place a full month later than 2004 and struck a lovely balance between fresh ripe stone fruits and vibrant muscular acidity. In the cellar, we designated the top half of the hillside block to this bottling due to its smaller berry size and added concentration – the remaining lower portion makes a small yet noble contribution to the RRV. The wine fermented rapidly to complete dryness and immediately displayed a brooding tight core of flinty, citric fruit. We chose to block a portion of the malolactic fermentation to maintain the young wine's inherent taut structure; yet opted to lees stir for four months to nurture mid palate texture in the face of such muscular, almost tannic acidity. The result is a bottling that successfully straddles the line between density and tension with a subtle core of ripe orchard fruits, sweet extract and a long hugely penetrating finish. With proper storage it should age positively for up to eight years from harvest. Youthful green-yellow color. Classic cool climate aromas of baked apple, wet stone, mint and sea salt. The palate follows the nose with fine mineral density, subtle nectarine and toasted almond flavors. The prominent acid backbone is offset by creamy mid-palate texture and lingering fruit sweetness. Gently decant immediately prior to serving to capture the wine's building richness and drink over 6 to 8 years. Serve no cooler than 55 degrees.